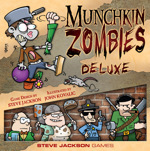 Munchkin Zombies Deluxe was only available in Barnes & Noble Stores . . . until now. Now you can buy it at your local store, as well as on Warehouse 23! What makes this edition "deluxe"? It's got a big gameboard to keep your cards in place, and six colored standies that you move on the gameboard as you level up! 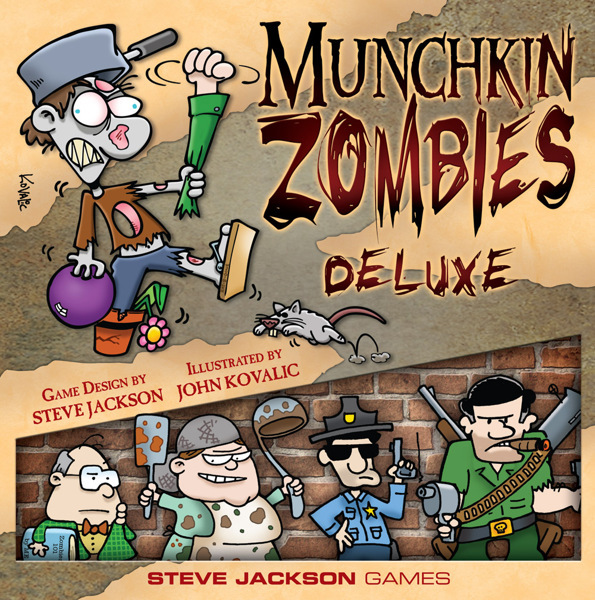 It's the sickest, silliest Munchkin yet! You are zombies, kicking down doors and eating brains. The "monsters" you're attacking are people, some helpless and some hazardous, with a few rogue zombies thrown in. The armor is whatever you've blundered across during your lurching search for brains. So bravely forth you'll go, with mousetraps on your feet and a bowling trophy protecting your poor rotting head . . . to level up, or to die.